The Madini team applies its wide ranging corporate, technical and geopolitical capabilities to strategically identify and select projects and ensure the effective development of those projects in order to optimise shareholder and partner value. Madini’s expertise covers the entire project lifecycle including discovery, strategy formulation, development and execution, feasibility work and technical assessments, environmental management, government and community partnering through to capital sourcing and deployment. Madini has a multi-commodity strategy, but recognises market fundamentals and focusses on a number of commodities that have positive long-term fundamentals. The company is broadly country agnostic (besides “red zones”) and has a successful track record of operating in most African jurisdictions. 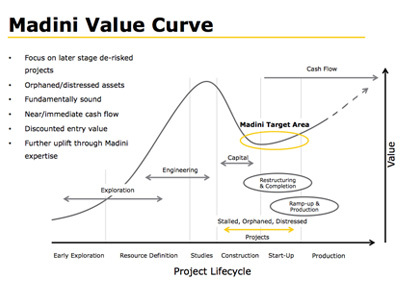 Focus is on near cash, or cash generative assets that will benefit from Madini’s capabilities and experience and therefore present a compelling entry point and an opportunity for all stakeholders to participate in significant upside provided by a re-evaluation that is driven by effective Madini intervention. Madini’s “hands-on” management approach will apply its expertise and experience to actively manage target projects on behalf of all shareholders and stakeholders rather than become portfolio managers. The Company’s corporate structure ensures close alignment of interest with our shareholders and partners. Our focus on first identifying and then actively managing compelling projects across a diverse range of commodities and jurisdictions coupled with a team that are not mere employees, but are long-term owners, ensures that investors receive greater value for less risk. The initial target of five projects allows Madini to provide top rated skills across a number of projects as required and spread costs while maintaining a clear focus on delivery.